The drawing is now closed. Congrats to Robert Mirman who won the device. 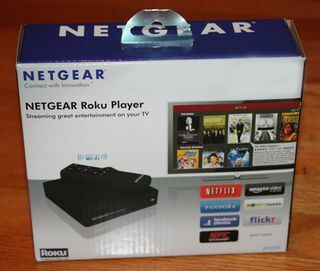 While Roku no longer has an OEM agreement with NETGEAR, I still have one NETGEAR branded Roku streaming player (Roku XD model) to give away. To enter the drawing, all you have to do is leave one comment on this post and make sure you submit the comment with a valid email. The drawing is open to anyone with a mailing address in the U.S. and I will select one winner at random in September. Good luck! I'm also giving away a Roku 2 XS here and a Western Digital WD TV Live Player here.